Tilton Woods located near the Mt Rainier National Park. A great place to relax and kick back. Or spend some one on one time with family or friends. 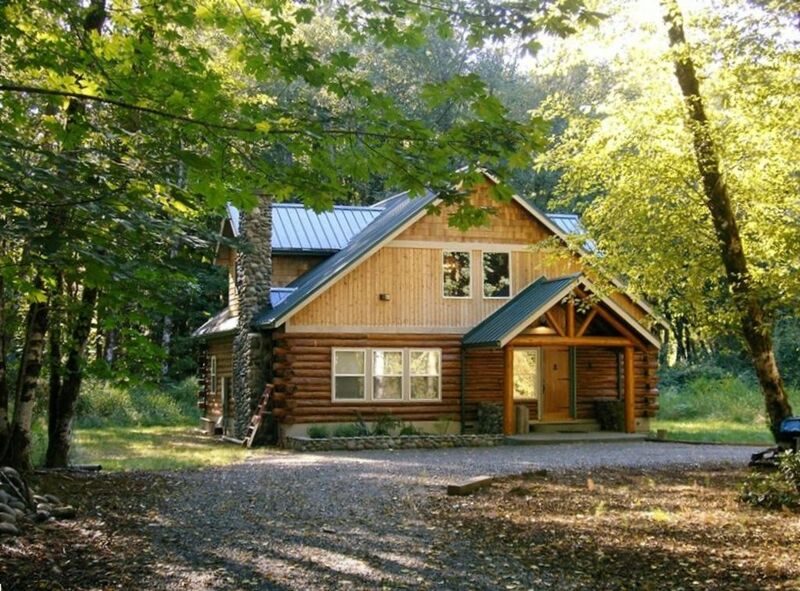 Enjoy a long weekend in a handcrafted log home approx 1800 sq ft. Nestled on five acres in a grove of trees along the banks of the Tilton River, four miles from Morton, Washington. Located less then one hour from White Pass and the entrance of Mt. Rainer National Park. This home is equipped with everything you need and will sleep 8+ people. Relax on the deck overlooking the stream or in the two person Jacuzzi tub. If its chilly light up a real fire in the river rock fireplace. We built this home with our own two hands and some help from friends as well. It took us five years but the result is very rewarding. We can't spend much time here ourselves so like to have others experience the calming effect of our home. Everything you need, owner is a gourmet cook. We had a great time at this log cabin tucked into the woods. The backyard was big enough to set up lawn games, the kitchen was well-stocked to cook all our meals, and the beds were very comfortable! All around, we truly enjoyed the stay, and also got to experience some small-town Morton, WA which was a treat. We would definitely stay here again! Beautifully kept up cabin—clean and private. Loved it!! It was our first time as a family renting a place. Was always afraid we would come upon a dirty rental. This was clean and private. Would definitely consider doing again. Had great quality time as a family in a beautiful cabin in the woods. We had a wonderful stay in this lovely log home. It was extremely clean, beautifully decorated and well-maintained. The owners were responsive and provided clear, well-organized instructions. The kitchen was equipped with everything you could possibly need. The beds were really comfortable. The only suggestion I would have is to have some outdoor lounge chairs or zero gravity chairs to take full advantage of the property. Just so there is no misunderstanding, this property is waterfront but on a very tiny, shallow creek. There is no where to swim or dip your feet in the water. Overall, this is a lovingly-maintained and thoughtfully-appointed home. We spent a long weekend in a log cabin in the woods. The whole family minus internet and cell service but we all agreed it was the best thing! We spent all our meals and evenings outside in the backyard and got into the little town of Morton to shop and look around. It was the perfect place to connect with people! Very comfy cabin, quiet, 4-5 miles from Morton, a cute little town. We enjoyed our time at this cabin though it isn't a normal cabin as it is huge. There were only three adults in our group, but this play could easily host 6 people as it is probalby 1800 square feet. The only thing we missed was cell phone reception, internet, and cable tv (which wouldn't be a big deal but we wanted to watch the Seahawks game). Definitely loved being out in the woods but not far from town. Will definitely be back. Located near the Mt Rainier National Park with it's many adventures and sites to be seen and experienced!